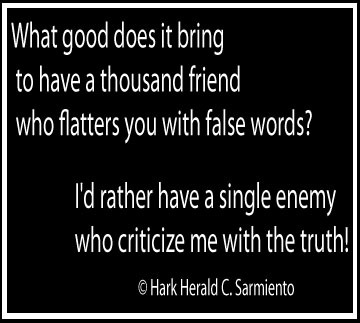 What good does it bring to have a thousand friend who flatters you with false words? I’d rather have a single enemy who criticize me with the truth! Posted on February 14, 2012, in CULTURE, Hark's Original Quotes, Lifestyle, Philosophy, Uncategorized and tagged enemies, flattery, friendship, truth. Bookmark the permalink. Leave a comment.